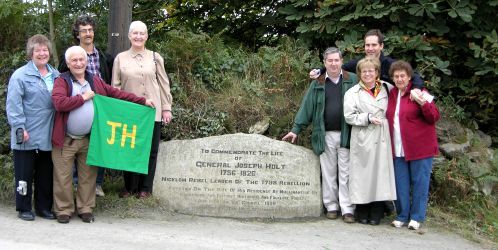 In September 2006, ten members of The Holt Family Fellowship joined in the celebrations for General Joseph Holt's 250th birthday in Ireland. Sonny & Fergus Holt organised the birthday party (complete with birthday cake) at Lawless's pub in Aughrim where Dr Ruan O'Donnell, the Head of the School of History at the University of Limerick, gave a dissertation on Joseph's place in history. The Irish and Australian descendants of Joseph and his siblings were able to dance together to the music of a Criac band and generally enjoy themselves. During the day, the group attended the unveiling of Joseph's image at Tinahely as arranged by Fergus and designed by Pascal Holt. It was the first Ireland/Australia combined family function held in Ireland since Joseph returned with Hester and Joseph Harrison on the 5th April 1814. The party also attended the Church of Ireland Mass at The Monkstown Parish Church, which had become the family's local church upon their return to Dublin, as discovered by Pamela Goesch. They also visited the nearby Carrickbrennan Cemetery, an earlier discovery of Pam's, where Joseph and Hester Holt are buried, together with their daughter, Mary Anne Shaw. Pictured L-R: Aileen Fowler, Thomas Fowler, Lionel Fowler (holding Joseph Holt's flag), Sharon Bodnar, Ross Fowler, Margaret Fowler, Matthew Fowler, Laurie Hibbard. The group had photos taken at Joseph's Mullinaveigue memorial beside his former farm and met Tommy Webster and Johnnie Medlycott of the Roundwood and District Historical and Folklore Society. The Fellowship members appreciated the Society's effort in cleaning away the roadside mud covering the lettering and cutting off the branches which had previously obscured the memorial erected to Joseph's memory in 1998. That night Al O'Donnell, with the assistance of his manager, younger son Conor, entertained our group with 1798 songs about Joseph which Ruan had researched. The heavy rain outside did not dampen the enthusiasm. 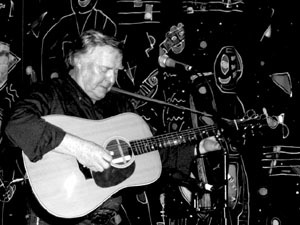 The Wicklow Arms, Delgany, was the scene for the entertainment. It is built on the former La Touche Bellevue Estate where Mary Anne Holt was hidden by Mrs Peter La Touche throughout 1798. The group stayed two nights at Glendalough House. On their last morning there they visited the adjacent St Kevin's 6th century monastic city of Seven Churches at Glendalough, the district which Joseph knew well and used for what the British forces regarded as his and his Wicklow army's notorious disappearances. There were many other non-birthday functions that were enjoyed, particularly the welcome by the villagers of Ballinkillen to see the 1798 Battle of Kilcumney Memorial to Father John Murphy and his Carlow and Wexford troops. The special village welcome which followed was reminiscent of those held over the decades in the Wallacia Progress Association's hall, at the foothills of the Blue Mountains on the Nepean River. It was catered by the Ballinkillen ladies, led by the justifiably famous local cook, Mrs Eileen Farrell, and was deeply appreciated by the ten Fellowship members. Two of the authors of Kilcumney '98 its Origins, Aftermath & Legacy, Mick Kinsella and Edward Moran, presented Lionel with their well researched and comprehensive book which included helpful maps to aid the understanding of this battle's movements and its aftermath. It was written with Conor Murphy under the guidance of Dr Kevin Whelan. It complements the General's Memoirs of Joseph Holt, Volume I, as it explains what happened to that portion of the Wexford/Carlow split force which stayed in Co. Wexford after the Battle of Vinegar Hill. The other portion, under the leadership of Colonel Garrett Byrne, Colonel Miles Byrne, the pitch-capped Captain Anthony Perry, Fr. Mogue Kearns and others, marched into Co. Wicklow to join General Holt and his Wicklow Brigade in the security of Glenmalure under Captain Michael Dwyer's protection. The evening with The National Pike Association at our Wexford Quality Hotel was both personally and historically pleasing, as the pike was Joseph's favourite attacking weapon. His description in the first volume of his 1836 published memoirs is reminiscent of later descriptions of the Australian soldiers' famous bayonet charges in both World Wars. Joseph Harrison Holt was born aboard the Minerva during the six months anchorage of the 1799 fleet before their departure to New South Wales. Fittingly, the tourists enjoyed a trip around the Cobh of Cork, in the hired prison launch, to gain some empathy with our ancestors. The group then flew back to New South Wales at a faster pace and in more comfort than the Minerva could provide their ancestors in 1799/80. Descendants retrace the footsteps of General Holt - article from both, The Wicklow People and The Wexford People, Thursday, September 21, 2006. See General Joseph Holt's Noticeboard to learn of our future plans.